Here are more of my horse drawings. Your drawings are amazing! I have tried my whole life to draw like that! You have so much precise thinking, and an amazing steady hand! Your drawings make me smile! I ride a horse that looks almost like dexter, her name is lucy. These are nice drawings. 😊 I draw too. AAAAARGH how do you draw that? It is amazing! I couldn't do it in a year of Sundays. That's awesome, great picture! Is it a herd of mustangs? I could never draw that. Wow how do you do that?! I wish I could draw like that! OMG that is so awesome! Keep drawing. I love it! How do you upload drawings? 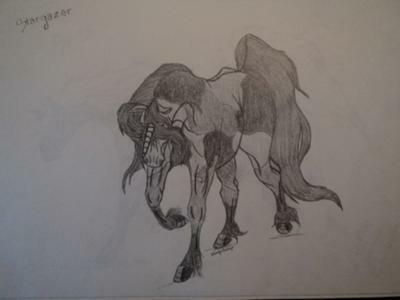 You can share your horse drawings here. You'll see a form. Type in the title and you'll be able to open the box where you can share them. This drawing is very amazing. I loved it at first sight. I love the perspective you have the unicorn in! I have a hard time with that perspective! Keep putting out art for us to see! What an artist! The drawing is so realistic! WELL DONE!!! I could never draw that! Its amazing!!! I'm so jealous of your talent! OMG that is sooo awesome! Wish I could do that! You are so talented! Whoa! You're a wicked artist! I love it, it is sooo cool and realistic. 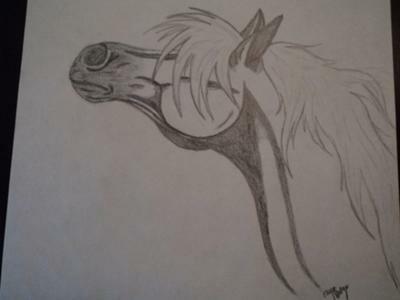 Best horse drawing that I have seen on this website! Awesome drawing! Do you have any tips? I could never ever draw that so awesome! Excellent! Look at these horses. No Way! Amazing! You are talented! how did you draw that so well? that is so cool! how did you do it? I love this! Where did you learn to draw so well? OMG! I love your drawings! You are awesome! So cool. So, so cool. Very pretty! I don't do horses that good. Wow! This belongs in an art museum! Are you like a professional? This pic is so beautiful and amazing! I would never be able to do that! I love horses. You have a gift. I do not know how long i have drawn them. But i know you are better than me!!! This drawing is marvelous. I draw horses a lot myself and I have been for the last two years but I'd never seen such a wonderful picture and anyone who says differently now a jealous self centered and up them self sort of person. If I could rate this I rate it:11/10! I have never seen a more amazing drawing! They are FANTASTIC!! I can't believe anybody can draw that good!!!!!!! This drawing is SOOO COOOOOL!!!!!! This pic is awesome!!! I don't know how anyone could draw this good!! A real work of art. Wow I like that I can do better but that is better than me. do you think you can teach me or just tell me how to shade the horses? i really like drawing but i'm not as good as u so can you tell me a few tips?? It would really help me out A LOT!! OMW that is absolutely gorgeous i wish i could draw like that. Fabulous Job and great details. Amazing! !I love drawing horses! But you are way better than me. I love the scenery! I'm horrible at drawing full body horses! Those are amazing sketches! Pleeeease let me know if you have any techniques! I would really appreciate it! 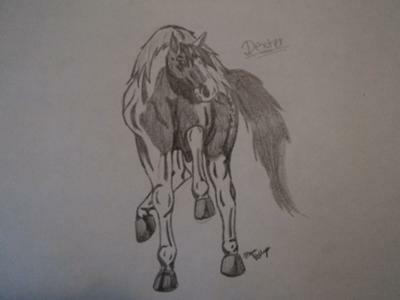 wow I wish I could draw like that but I am horrible at drawing especially horses! wow i have drawn similar things to those drawings and got 1st place at a college art show. so have you ever thought of drawing them on the beach? Wow are you some sort of horse art thing? Your drawings are AMAZING!!! These drawings are AMAZING!!!!! My favorites are #1 and #4, but i love all of them! How did you do that awesome scene w/ the herd of horses? It was great! You should enter some art competitions. I think you could do very well! BEAUTIFUL!!!!! love the art, i wish i could draw like that! You did good job. I love horses but I can't draw as good as you. This is a very good picture!!! i can't draw a good horse to save my LIFE!!!! ;p but you have inspired me to work on my drawing... thanks!! that drawing is soooo good and soooooo amazingly cute too! your other drawings are really cute! but this one has got to be my fave!!! U ROCK! YOU ARE AWESOME!!!! CAN YOU TEACH ME HOW TO DRAW LIKE THAT? very good better than me i think!!! How do you learn to draw like that? I think you will be an artist in the future! WOW! you did great on that drawing, talented! You know, you are great at drawing! Howrse: Mafia Family :)PLZ ADD ALİCİA RACİNG HORSE GAME SİGN UP VİDEO! OMG whoever you are... your amazing!! I love your drawings! Especially the drawing of the wild horses. I love to draw pictures like that, but i can't do it as well as you can!! I'd love to see more drawings please! OMG Girl! I wish I could sketch like that! I have a little mini art studio in my room(a chest and some pencils) but my pictures never turn out like yours! You inspire me to not slack off when I'm drawing. You should be proud! LOL I sound like an adult! OMG!!! And I thought I was good? My drawings look like a Pre-schooler's art compared to this!!! :) Awesome! Very good and skillful! You could make money drawing like that! Very nice shading and detail, a very nice scene. Good Job! You draw amazing horse pictures, when did you start drawing horses? Did you ever ride horses? I am going to horse riding camp next week please send me anything like pictures or anything. Your drawings are so good! I can't believe how realistic all of them are! I love all of your pictures but my favorite is the picture of the horses by the lake! you cannot have drawn that!!!!! They are absolutely AMAZING!!!!!!! That's really good and realistic looking too! Those drawings are amazing. I wish i could draw as good as you. And i'm the only one in my family who can draw horses. So wow! Very nice(; you just do this from creativity or from a picture etc.? this horse picture is beautiful, thanks for putting it up the rest of them are okay. that is amazing! i sooooooo can't draw like that..
That is one of the most amazing horse drawings ever! the detail is so amazing and i also like your other horse drawings that you have done. that is the BEST horse drawing i have EVER seen in my life :) you are going to have a very good life if you keep up the great work! i loved that drawing it reminded me of freedom and YOU are the best drawer in the whole wide world! ( no offense to the other good drawers) but YOU are the best :) keep up the great work! you are super good. You should get a career for it. I will go to a college in wyoming to become a horse trainer (so i can tame my own horse), artist, author and other things. I wish i had a horse but i will take care of Tiger an american quarter horse. I will also be going to horse camp this summer in southern colorado that will be awesome. Fresh air and best of all the rockies. People say there are still some wild mustangs hanging around there. Totally sicked. Your such a talented artist!!!!!!!!!!!!!!!! 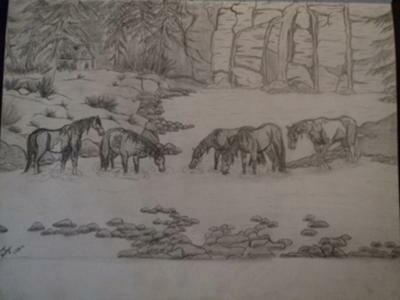 It is ssssssssooooooooo real, I could feel like I could really touch the water and the horse and smell the pine just on word of advice, try and add some color, it looks awesome but you need to color it because it looks drab without it!!!! If you are under 15, then you are probably the best artist in the whole world! I Love YOur Drawings. They Are So Beautiful Plus It Looks Like My Horse!! Wow! Your picture is the best picture I've ever seen! The back round looks so perfect! I wish I could be such a great artist as you are! You're like the best artist ever! How on earth did you do that? It's just... BEAUTIFUL!!! WOW that is amazing, you are the best artist i have ever seen! how in the world do you draw like that? hey u r an artist. i love ur pic, it is the best and u rock!!!!!!!!!!. Wow! I'm stunned! This is sooo good!! wow how can you draw like that, it's amazing. i've tried myself and i was rubbish well i'm getting better but i guess i can't get over your amazing drawing. i really wish i could draw like you i just came and had a look at the drawings and my eyes looked at yours. it was that good i'm gonna try to draw a horse and see if it could be like yours. it's so unfair well i'm meant to be the best drawer in my class but i don't think i am. Wow! This one is really god! that is really cool! how did you do it? You are so good at drawing horses!!! I love it!!! awesome! love it, better than mine. wow llllllllloooooooollllllll. cool need to trace spectacular fab rock on. These are beautiful hun ! Keep up the wonderful work ! i love your picture, it's AWESOME! You are really good at drawing! No, you are ULTRA SUPER at drawing!!!!! Can you please please please post more!? Awesome! I wish I can draw that good! I'm an artist too. How do you upload them? they're awesome! where did you learn to draw like that?! SO XD!!! I love your drawings they're so pretty and cute! I think that is really cool! i wish that someday that i will get that good. But i paint them XD. i wish someone could teach me how to draw that well. i really <3 those pictures. My fave is the herd! All of your pictures are amazing, but my favorite is the one of the herd by the waterhole. Is it a water hole because it looks like one? This is amazing! How'd you learn to draw like that? I wish I could! These pictures are amazing. You are an amazing drawer. I wish that I could draw like that but I am working on my drawing skills and hopefully I can draw as good as you. wow you are good at drawing how long did it take you to draw the first drawing? hey, i love the scenery! i also love the multiple number of horses, i always have a hard time with that. keep it up! how did you draw these drawings? and one more thing WOW!!!!!! All of them is good but my favorite is the first one. They are so, hmmm, I can't even describe how good it is! you are soooooooooooo good at drawing! i love your drawings! Love the second pic of the unicorn it... is... AMAZING!!!!!!!! Wow!! You're a great artist! OMG!! I wish I could draw THAT good!!!! This is a great picture! I'm a horse drawer myself. OMG THIS IS THE BEST DRAWING I HAVE EVER SEEN!!!!!!!!!!!!!!!! U TRULY R AN ARTIST!!!!!!!!!!!!! !